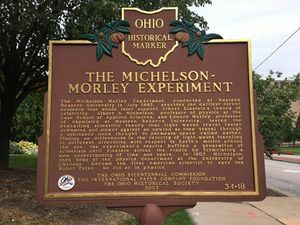 The Michelson–Morley experiment was an experiment that was first performed in 1887 by Albert A. Michelson and Edward W. Morley. Unfortunately, a number of writers on this topic tend to gloss over, or sometimes mischaracterize, what this experiment demonstrated, its significance, and how it was a turning point in science which necessitated the adoption of a radically different and alternative model of space. 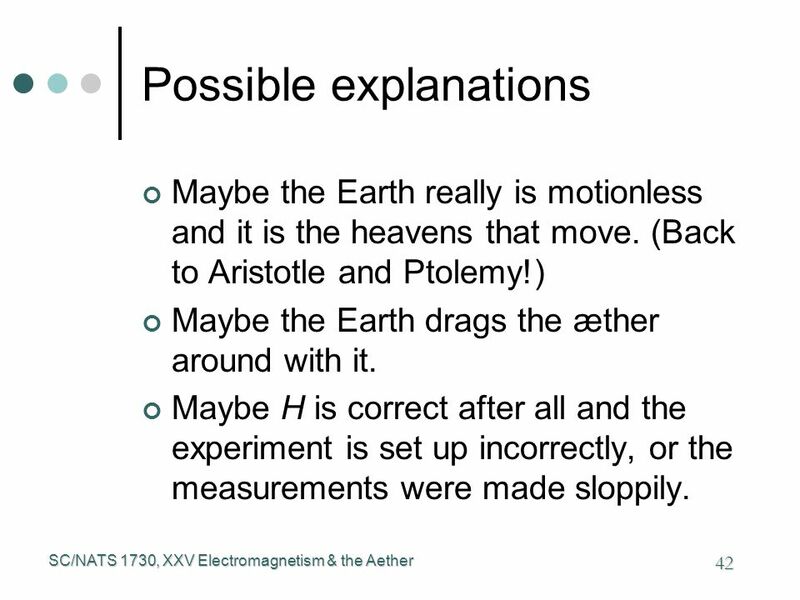 The shocking result of this experiment is that the earth did not measurably move around the sun at all, in contradiction to all expectations and the accepted astronomical model. Michelson and Morley found that a light beam discharged horizontally in the direction of the Earth’s assumed motion showed virtually no difference in speed from a light beam discharged north to south or south to north. In other words, the experiment failed to detect the Earth moving in or against space, of whatever space was understood to consist. Michelson and Morley and later scientists repeated the experiment many times, and in many different horizontal axial positions and configurations, at different times of the day, all with a null result. The earth was seen to be motionless. 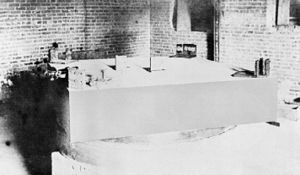 The experiment has been referred to as "the moving-off point for the theoretical aspects of the Second Scientific Revolution"3 and directly influenced the creation of Albert Einstein's Theory of Relativity. 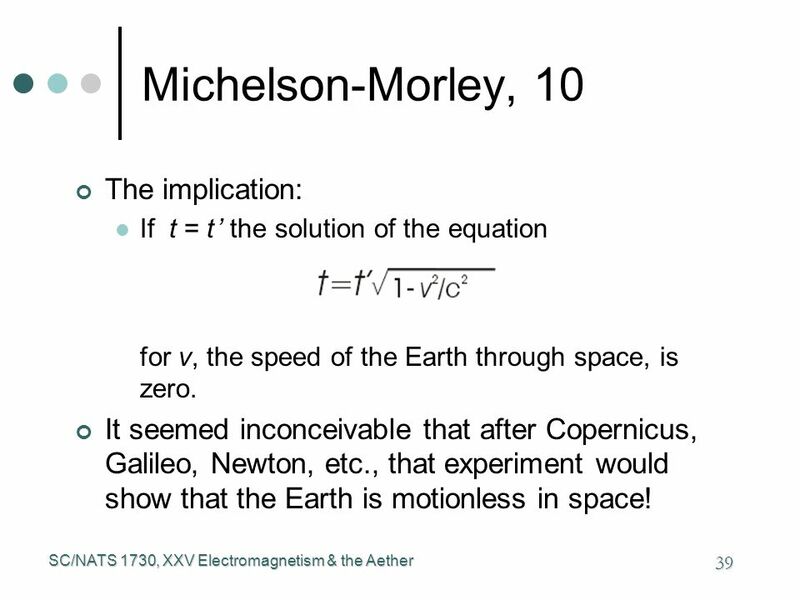 The Theory of Relativity subsequently found favor among scientific circles because its model provided an illusion, where the velocity of light is constant to all observers, and seemingly explained the motionless earth result of the Michelson-Morley experiment. This fundamental change to the nature of space and time allowed the theory of the earth's motion around the sun to survive direct contradicting experimental evidence and encouraged, perhaps forced, its adoption as the accepted model of space for Copernicanism. 1 Letter dated April 17, 1887, in the Edward W. Morley Papers, Library of Congress, as cited in Dorothy Michelson Livingston’s Master of Light: A Biography of Albert Michelson, New York, Charles Scribner, 1973, p.126. 2 Einstein: The Life and Times, Avon Book, New York, NY, 1984, p. 109-110. 4 G. J. Whitrow, The Structure and Evolution of the Universe, New York, Harper and Brothers Publishers, 1959, p. 79. 5 Michelson and the Speed of Light, 1960, p. 76. 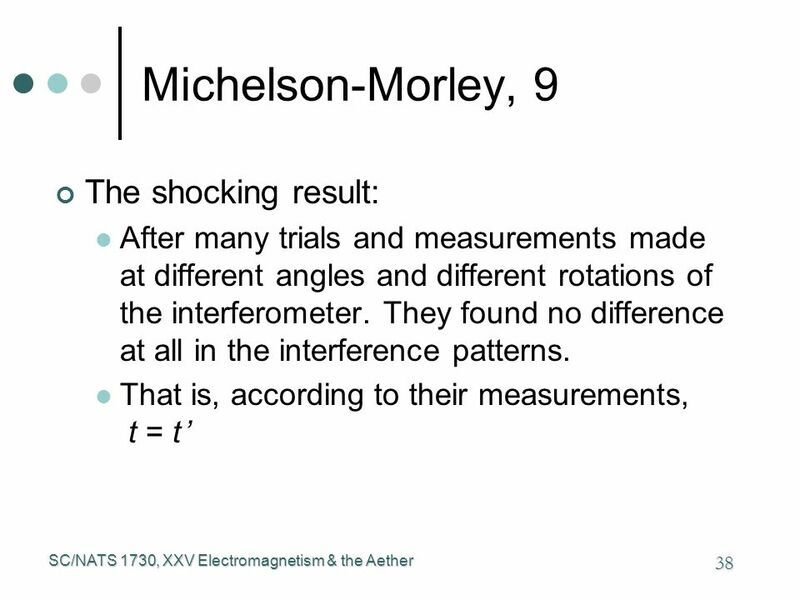 Material from a York University course by Prof. Byron E. Wall provides a good summary of the Michelson-Morley experiment and its result. Below are slides that tell the story. Interested readers should feel free to go through the entire slide deck. 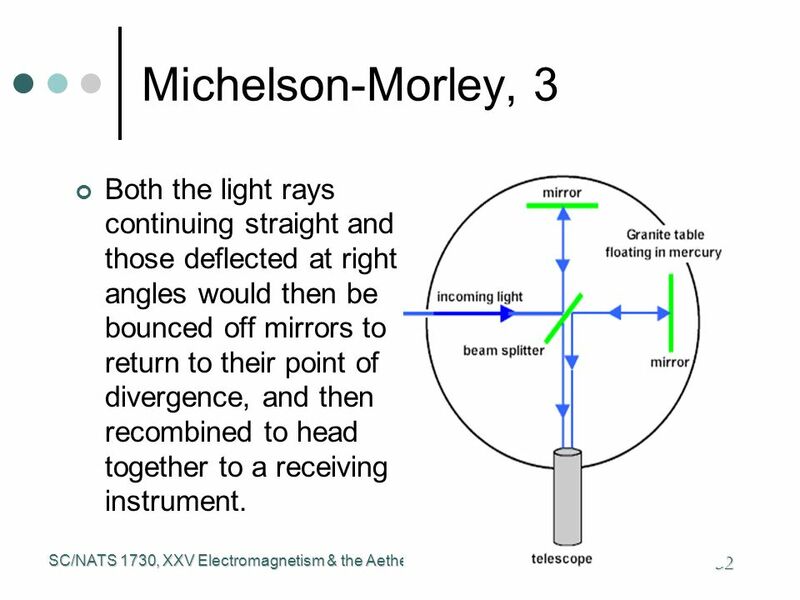 Since 1887 the Michelson-Morley experiment has been repeated and verified on many occasions, with several different methodologies. The Michelson-Morley Wikipedia article (Archive) maintains a list of subsequent experiments. 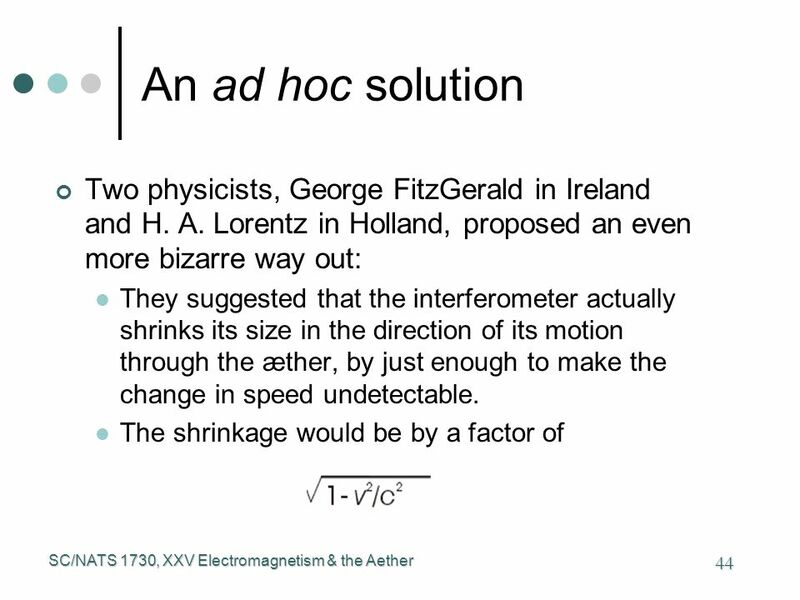 Einstein also mentions in regards to SR: "I also started to work on the problem of Fizeau’s experiment and tried to account for it," which is another light velocity experiment. The marker describes that, when science was confronted with direct evidence of an earth without motion around the sun, an entirely new model of space and time was required to explain it. An interesting analysis on why Relativity was accepted in science. 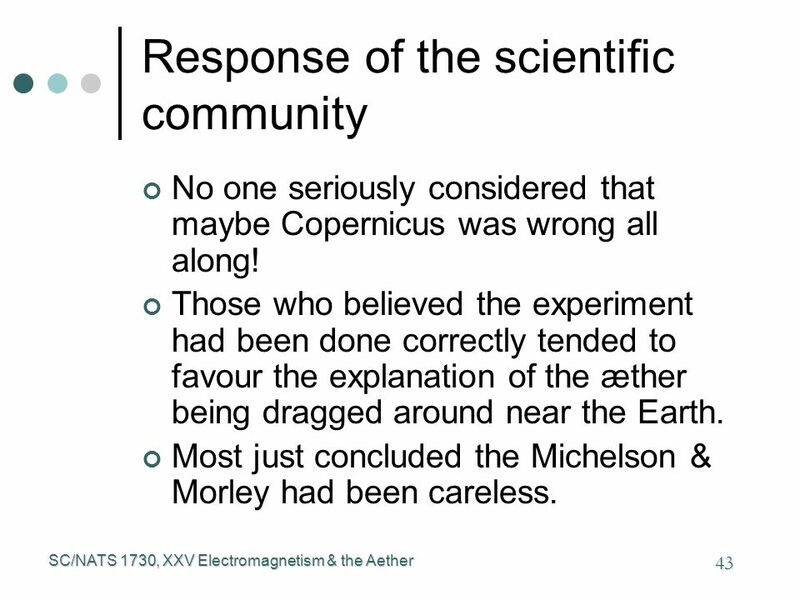 The author concludes that much of why it was accepted is because it was a world-model which purported to explain the Michelson-Morley experimental result of a motionless earth. Another top reason was because of an underlying desire for a unified, elegant physical theory. The author provides quotes by the scientists of the day, identifying the Michelson-Morley null result as a primary factor. “ José Sánchez-Ron [a prominent Spanish physicist] suggests that G.A. Schott and other British physicists were interested in relativity because it offered a way to deal with problems arising from the new atomic physics, in which the magnetic interactions of electrons and their behavior at very high speeds needed to be better understood. 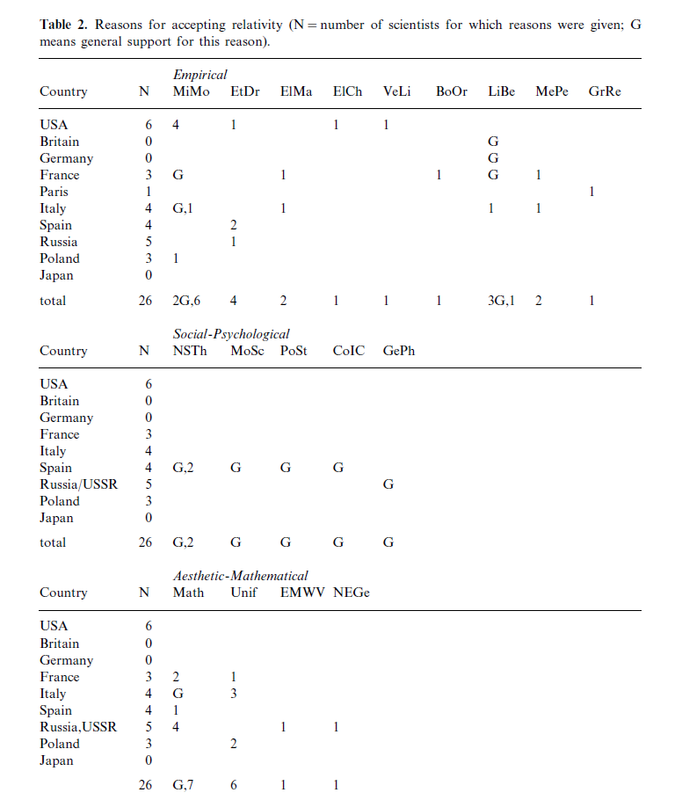 The author provides three statistical analysis tables for why Relativity was accepted, focusing on Empirical reasons, Social-Psychological reasons, and Aesthetic-Mathematical reasons. 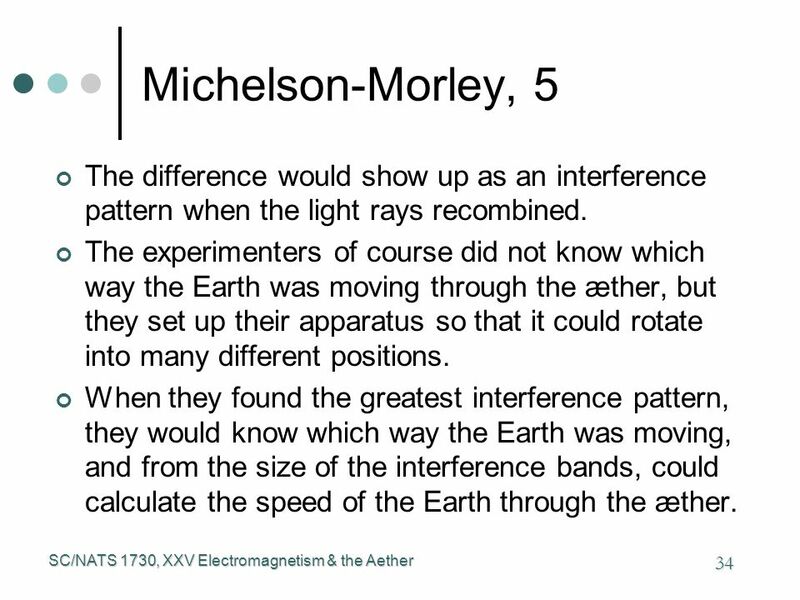 The reader should note that the Michelson-Morley Experiments are a subset of the "failure of the ether drift experiments," which are a larger collection of experiments which have failed to detect earth's motion through space. 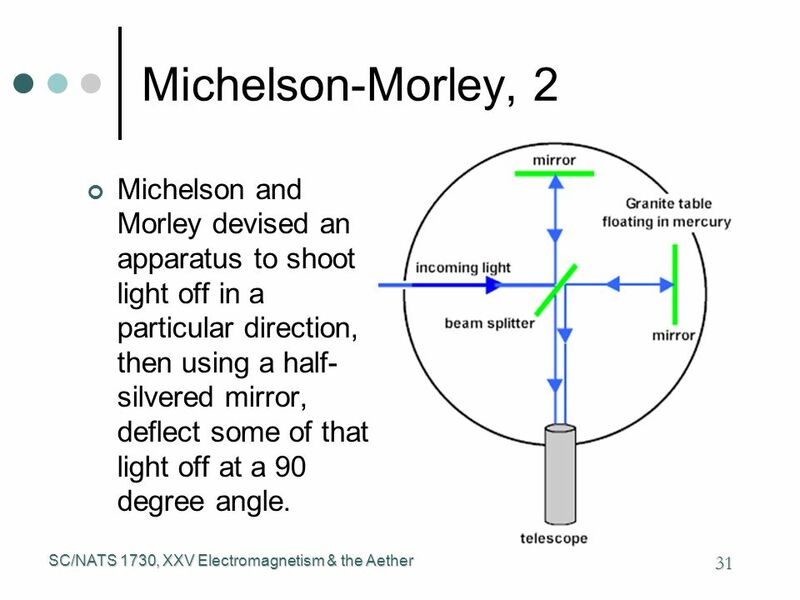 The Michelson-Morley Experiment is the most known and famous experiment of the collection. Description: "This video is a reading of a PDF written by Robert Sungenis in 2016 called "Albert Einstein: The Earth Mover- How Einstein Made The Earth Move (When All The Experiments Showed It Didn't Move)" This video will challenge you to decide which belief is pseudoscientific... the belief that the Earth moves... or that it stands still." This page was last modified on 12 April 2019, at 02:44.